I've been getting the Ali Edwards Story stamp and kit since the start of the year and loving it as it's getting me back into layout making not just project life. I didn't realize I missed doing layouts until these kits started coming in the mail. This 6x8 page is one of the busiest and one of my favorites. Last year I had hip surgery and had to take 6 months off from running. Giving myself the time to fall back in love with scrapbooking and taking up bible journaling. The products on this page all came from the kit except the wood grain block letters those are Webster's Pages. I bought a lot of the add ons that month including the sheet of square stickers. I used the entire sheet on this page changing the order, but using the sheet to keep the spacing of them. 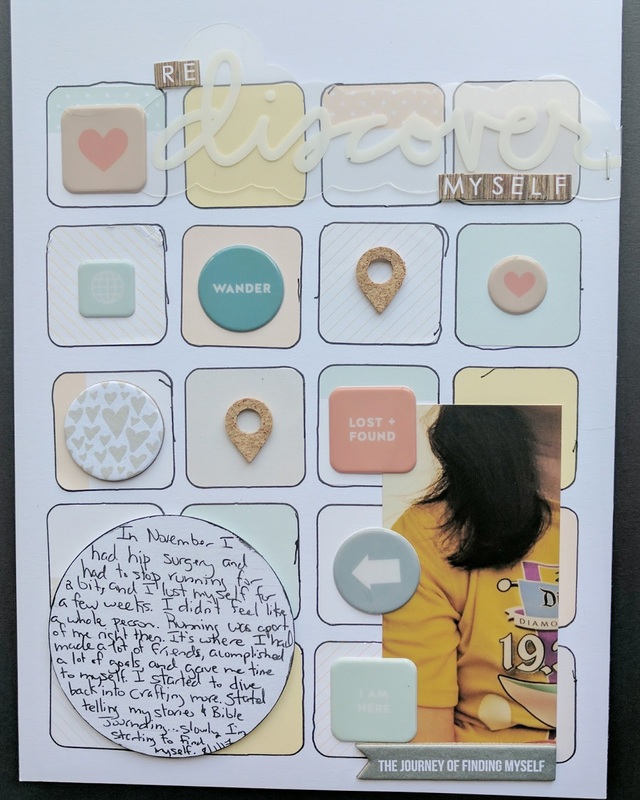 The photo was a scrap from a poor print job and should have been tossed, but it worked so well telling the story of finding myself this year.